Digital Scholarship + Collections in the Library is available to consult or collaborate with you on your digital scholarship project. We have experience and expertise in the following areas. Please contact us if you are interested in partnering with the Library! Contact: Denise Hattwig, Curator, dhattwig@uw.edu. UW Bothell Students are encouraged to archive and publish their own work in their Google Sites ePortfolios. UW Bothell Learning Technologies supports student use of Google Sites. Find out more about this option on the Learning Technologies ePortfolios page. see also the UW Libraries' Who may deposit their scholarly materials into the archive? 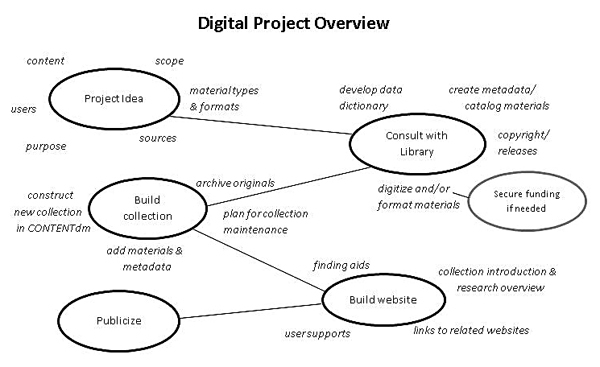 Student work is included in Digital Collections only when it is part of a faculty-managed, collaborative project with the Library. Faculty initiate this process in consultation with with Library. The above archiving options are available to UW Bothell students.